Yoga and water sports are the perfect combination for a relaxing and active holiday. WindSurfYoga will bring your mind and body to the here and now, helping you adopt a philosophy to enjoy every minute of your life, doing what you love, and making the best out of it while truly living. WindSurfYoga founders Martin and Eline met in Fuerteventura and, while traveling together, decided it was time to find a place to share their passion for life and windsurfing. WindSurfYoga is that place. The surf house is shared with a couple other schools, all people are surf, windsurf and/or yoga minded. Visitors are of all ages! There is a pool, shared kitchen shared living room and shared bathroom.The rooms are equipped with four beds. Private rooms are possible for a fee and only if space allows! The terrace has space to relax, do a barbeque, chill at the pool. Feel at home, and dive into the laid-back easy going lifestyle. The Yoga Class will help you get ready for the day or unwind and relax after a good day on the water. Once a week there will be an optional joined dinner, which is not part of your package.The joined dinner will be either a barbeque on the beach, a Tajine dinner night on the roof or a good local meal outside. Every day you will be picked up for the surf/windsurf class depending the best weather conditions and your session will be in the morning or afternoon. You can choose for 3 days surf with 3 days windsurf course or alternatively you can choose a 5 day surf course wherein you will have one day off to rest and go on adventure or chill on the beach. 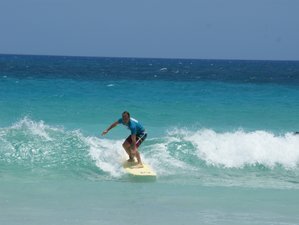 Definitely the best way to spend your holiday doing board-sports and spending as much time possible in the ocean! Eline is a certified yoga teacher and she also has certifications on relaxing massage, sports massage, and diverse Ayurvedic massages. She teaches yoga in different styles, mixed to one comforting class. Most important of her classes is "what do you need right now?" She aims her session at the needs of each individual. She loves windsurfing, surfing, SUP, yoga, and traveling. Besides a yoga teacher, she is also a windsurf instructor and SUP instructor. Eline grew up in Holland but when she decided to choose for her passions and following her heart, she quit her job and moved to Fuerteventura. Martin is a windsurf instructor. He loves to be in the ocean, surfing, windsurfing, and in the rest of his time, he likes shaping surfboards and does some yoga. He loves teaching windsurfing. Fuerteventura has a whole year 18 - 25C temperature. This holiday will take place on the north of this beautiful island where you have stunning white beaches and perfect water-sport conditions. It's been a surfers paradise for many years, the tourism is not as busy as on the other Canary Islands and the vibe is very relaxed. Experience the yoga and laid-back lifestyle under the sun. No meals are included in the courses. Tho bakeries are around the corner, cheap and really good! You can book a massage separately or you have an option to book it at the location too. 7 nights accommodation based on shared room including pool, kitchen, shared bathoom. Please book your flight to arrive at Fuerteventura Airport (FUE). You can fly into Fuerteventura airport (puerto del rosario, FUE) its also possible to fly into Lanzarote and take the ferry, if you do so make sure you and before 15.00 as you have to be in the harbour (not near the airport) before 18.00h!! From the airport you can take the public bus which takes about 2,3 hours but is fairly cheap! or you can add an airport transfer to your package you will be picked up and dropped of at the airport! Airport: Fuerteventura Airport Airport transfer available: Fuerteventura Airport (US$79 per person) Additional charges may apply. You can request this in the next step. WindSurfYoga organizes yoga holidays, windsurf, surf, and yoga camps around the world. They love to inspire you to to meet, connect, travel, discover, and grow. The package standard is possible to book any day. The camps (with special dinners etc) are offered for certain weeks.